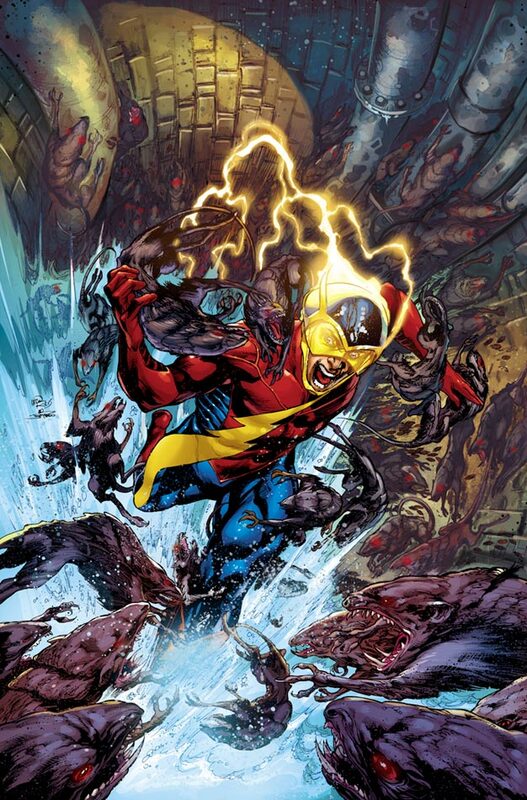 Today DC Comics revealed their brand new redesign for Jay Garrick, the Golden Age Flash. Jay, and the rest of the Justice Society of America will feature in James Robinson and Nicola Scott's new ongoing series Earth 2. No longer will Jay and his pals be the elder statesmen of the DC Universe. Gone are the connections to World War Two. From what little Robinson reveals in his recent interview with Newsarama, these heroes from Earth 2 will have been around just as long as their main DCU counterparts have. It's a groovier, funkier, younger Earth 2! 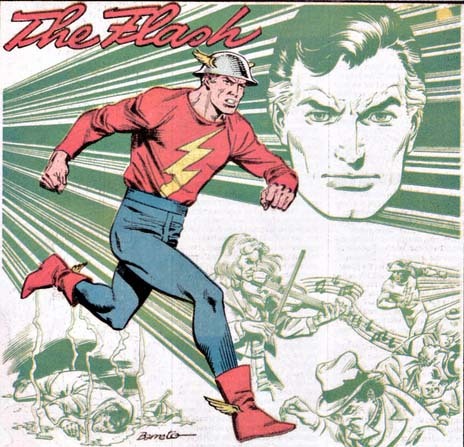 ‎Jay Garrick is very much our point of entry to the world. He's the "everyman" character that we all like, that we all want to be, want to hang out with. That's kind of the role he was in the original Earth-2, and I think it suits him well. He's the likable guy, the one you care about. Alan Scott, as you'll see in the first issue, is a titan of industry and communications. He's a noble, gallant man who will rise to the challenges presented to him. Al Pratt is a solider who is also everything that you want Al Pratt, this tough little fighter, to be. And yet he is faced with an impossible task and rises to the occasion. Robinson has absolutely nailed all three of these characters! If you asked me to sum up the personalities of the previous versions of Jay, Alan and Al I honestly couldn't do better than the above descriptions. So what exactly has changed? Well, judging from the image of Nu-Jay that DC have released the costumes have changed. And of course they're now younger and they didn't fight in World War Two. But is that all these characters are? A costume, a war and some wrinkles? Of course not! These characters have been through the hands of some of the best writers in comics, including Paul Levitz, Roy Thomas, Len Strazewski, Geoff Johns and Robinson himself. Their personalities have been clearly defined over the years. Their status as elder statesmen is an important aspect of these characters, but it's by no means the only aspect. So I say, stick a young Jay Garrick in the modern era! He'll survive it! As long as he's still recognisable as Jay, then I'm on board. Of course, I may be wrong. Maybe Robinson has thrown the baby out with the bathwater and this new Jay is nothing like the old one. Maybe Earth 2 will be rubbish. But judging from Robinson's descriptions of Alan, Al and Jay, I doubt it. I hope I'm right. Don't panic people, this could be a great comic! The Justice Society is more than WWII! Jay Garrick is more than a tin hat!